The Juliana Premium greenhouse is billed as a top-of-the-line, high-strength, high-quality hobby greenhouse. In this respect it did not disappoint. The Premium truly is a strong and well-built greenhouse with it's heavy duty aluminum frame and extremely thick 10mm polycarbonate panels. If you live in a location that gets extreme winter weather with very strong winds and multiple feet of snow, this would be a good consideration. The panels are very insulating and if you continue to garden throughout the winter, every millimeter of polycarbonate thickness helps! The Premium comes in a few size options (9'x9', 9'x12') which is nice, but we would have liked to see a few more sizes available, or possibly a greater spread between the sizes so some longer length greenhouses were an option. Something like a 9'x18' or 9'x20'. The height at the peak of the Juliana Premiums is significant (nearly 8 feet) which gives plenty of headroom while standing in the center of the greenhouse, but the roof is sloped much more than the barn-style of the Grandio Elite greenhouses, so you may be ducking down a bit if working on staging tables set up along the side walls. Installation of the greenhouse was not overly difficult, but was not quite as easy as the Grandios. The primary reason for the difficulty was the, in our opinion, poorly written instructions. We spent almost as much time deciphering the confusing instructions as actually putting the greenhouse together. We didn't think the actual construction of the greenhouse was particularly hard once we figured out what to do, so we hope that in the near future Juliana will see fit to rewrite the instructions to be more clear and understandable. The Juliana Premium has an optional base kit that can be used to secure the greenhouse to the ground. As with the other greenhouses that don't come with the base inlcuded we would definitely recommend purchasing the base. It doesn't add much expense (around $200), and is extremely sturdy and a much better solution that simply erecting the greenhouse directly on the soil or on a custom built wood base. A couple of the nicer features the Premium offers that many competitors do not is the enclosed rain gutter and downspout system, and the hinged, lockable Dutch door. The rain gutter system is great at keeping the rain from pouring off the sides or front, which may not be a huge deal, but is a nice added bonus. And the Dutch doors gives the Premium a high-end, European style feel, along with the frame shape, that adds to the attractiveness and functionality of the greenhouse. Conclusion: The Juliana Premium series is a very nice greenhouse, especially for those gardeners who live in areas with very harsh winters, or who like the look of a European-style greenhouse versus the barn style of the Grandio Elite. It is attractive, has nice standard features, is extremely well insulated and durable. Also, be aware that the Juliana Premiums are approximately double or more the cost of the Grandio Elite's (our #1 pick) per square foot. Our top-of-the-line Premium greenhouse is a beautiful addition to your yard and garden. The thickness of the polycarbonate makes the Premium ideal for wintering over your plants, while providing a welcome escape from the cold winter months. Some people even set up a small table and chairs - a place to relax and enjoy a warm respite from the cold. The nearly eight-foot peak and four and three-quarter-foot sidewalls makes working in the Premium comfortable and spacious. The floor-plan allows considerable space for seed starting, container plantings, tropical plants and trees, orchids and more! 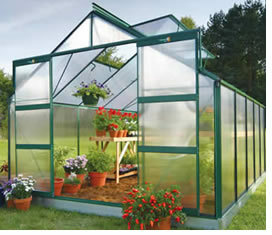 The Juliana Premium series is truly a premium greenhouse line with many outstanding features. It is distinguished by thick 10mm polycarbonate and extra-strength profiles. The unbreakable polycarbonate panels offer superior insulation, and fit snuggly into the greenhouse with a tight gasket system, which also gives a nice finished look. The maintenance-free, heavy-duty aluminum frame, has profile dimensions up to 50% stronger than most other models. The Premium is also distinct in its height, enclosed gutter system, downspout system and hinged Dutch door.